Shadows cannot exist without light, however, and you’ll find enough happily-ever-afters to lift your spirits in this anthology full of adventure, dark powers, and ultimately the enduring power of true love. 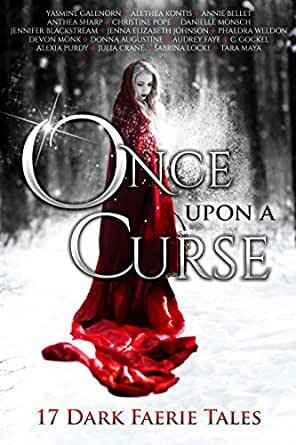 *Volume 1 in the Once Upon Anthologies Series featuring dozens of faerie tale retellings. Don't forget to grab Once Upon A Kiss (Volume 2) and Once Upon A Quest (Volume 3). You get hooked into the storylines then it ends, leaving you up in the air ... obviously meant to encourage you to buy their full books. 5.0 out of 5 starsA new adult twist to some childhood favourites. Consider those much loved childhood fairytales from new, darker and deeper angles. Enchanting, beguiling and lovingly put together these short retellings are a new direction to herd some old favourites in and grace another generation with their tales of trial, tribulation and triumph. Aylin is a nonmagickal girl living within a very magical world. Variance is incredibly dangerous for those without magick so she has never left her home. Her father used to go to town and trade at least once a year but he died. Should she stay safe at home? Or venture forth to find the things she needs? How will she survive without her father? Is she destined to die alone never even meeting anyone new? Anna is just a normal girl living in the human world and trying to make a better life for herself. She is in college and trying very hard to get good grades... Too bad she just failed her Biochemistry Midterm and it looks like all her hard work has been for nothing! Why does the homeless guy near campus seem to be taking an interest in her? How can he seem to be a handsome well dressed man and a bum at almost the same time? Is she losing her mind? Or is there more to him than meets the eye? What can he possibly want with her? I was looking forward to reading this, and for the first few stories I was pretty happy with my purchase. However, it soon became clear that not all stories were of the same quality level, and, worse, a number of them are either teasers or opening chapters to longer works (some not yet published), meaning that these "stories" have no end, and really no discernible plot. For example, "Beauty Inside Beast" (which is 10 chapters but I think under 30 pages.. the first chapter is one sentence long) sets up a few interesting characters and some mysterious murders and teases.. .what? I'm not sure, because it ended with no resolution to anything, really not even a START on the murders, but it did have an ad for the author's other work. "The Morrigan" is probably the longest story, but I stopped reading after a few chapters. It's like the author didn't re-read it to check for inconsistencies.. After getting beaten senseless, the main character wakes up, dazed, and looks at the ceiling. He thinks it looks like the ceiling of his uncle's trailer.. hey, it IS the ceiling of his uncle's trailer! And there's his uncle, yep. Then a minute later he notes that he hasn't seen his uncle since he was about 10 years old (but apparently has perfect recall of what the ceiling looks like). Then he remembers a mug his uncle has and what he likes to drink. Then he notes that he "barely remembers" his uncle. And so on. Lots of "I must be going insane.. this magic stuff can't be real!" type of thing, which always drives me nuts if it goes on for more than about 5 seconds of the person's life. And if you're told that a group of men in black hoodies are beating people who fit your description with iron pipes at night, and ten minutes later you get attacked at night by a group of men in black hoodies wielding iron pipes, you should probably figure out PRETTY QUICKLY what's going to happen next. Anyway, like I said, a mixed bag. Some good short stories, and a lot of what might as well be free Kindle previews of other work. Witches and warriors, demons and darkness, brave women and true love, and a vampiric take on a classic fairy tale—it’s all here in this boxed set, and more besides. Because many of the stories have layers to them that remind us of other stories and folk tales and ballads, like the silver dagger Yarrow carries in the collection’s opening story, “Yarrow Sturdy and Bright,” by Devon Monk. This is a fierce, feminist take on “The Pied Piper,” and it sets the tone for the stories that follow. The stories run the gamut from reimagined Celtic folklore like Anthea Sharp’s “Fae Horse,” a wild ride on a NightMare to Christine Pope’s lyrical Russian take on “The Snow Queen.” C. Gockel’s urban fantastic version of Cinderella features a wildly sympathetic stepmother, a “stepsister” who’s a 15-year-old gay kid exploring his own fabulosity, and a whiny “princess” whose diva antics are consistently amusing. Audrey Faye’s “The Grim Brother” has one of the best openings in the book, “Some say children can’t be evil. I know differently. I stand here, looking at the fresh mound of earth in front of my sister’s gravestone, and know that I have buried evil in consecrated ground. For a priest, there is no greater sin.” No reader on the planet is going to stop reading there. Faye goes on to tell a haunting version of a familiar tale that is beautifully crafted and so elegantly simple that it feels like you’ve always known this version of the story, that this is the only one that tells the truth. And there’s a lovely little character Easter egg thrown in for good measure. Another story of note—this is a really strong collection, so these are just my favorites—is Jennifer Blackstream’s version of Rumpelstiltskin, “The Final Straw.” It’s another story with a sneaky little shout-out to another fable in its closing sentences. And what would a book of fairy tales be without a unicorn? The collection concludes with Alethia Kontis’ “The Unicorn Hunter.” You’ll enjoy that one so much that when you click the little triangle to take you to the next story you will be disappointed to find you’ve reached the end of the book!! Maddox and Milly try to find a way to be together in this Rumplestiltskin tale with a demonic twist. I've read a few of her fairy tale series and admit, for a novella, I liked this one best. I was satisfied with the the turn of events and conclusion in this story than I was with the first two fairy tale books. Detective Kenna Morgan has a killer to catch..and she has to survive the publicity rounds for the pin up calendar she's in-it's for a good cause but she could do without seeing Callen Beist again. Even though the first book in her Grimm Nights series left me hanging for an actual ending, Monsch's style of writing is unique-she never goes the direction I think she will. The story captured my interest with the cast of characters and the allusions to Kenna's past..I just wish it was longer to see what happens between Kenna and Callen! Yarrow sets out to find the Tailor's son, her lost love, when he fails to return after a year. To save him, she has to defeat the Pied Piper before time runs out. Devon Monk was a recommended author to me and I will be checking out her other work-in a short span she had me entranced with this remake of The Pied Piper. The attention to detail was memorable. I normally dont buy these kind of books unless an author i love is included. That is why i purchased this one. Im a major fan of Yasmine Galenorn, her stories are pure gold. This was as well (really think Teal needs her own series). I was pleasantly surprised to find that i really enjoyed all the other stories as well. I will be looking up the majority of these authors to buy their other works!